Art Services Do you have an image that is too small? A logo that needs to be cleaned up? A color photo that you want converted to a line art drawing? Or in need of the background removed from an image? SellMyTees can take whatever artwork you have and recreate it in a clean hi-res .png file to be used in the Designer Studio. Have an idea for a design, but have no way of making it happen? SellMyTees can help there too. Non Member price is $40. Members receive a 50% discount. Most art services are charged a flat rate however price may vary depending on difficulty of design. Send your art and instructions to art@SellMyTees.com to get your quote now. PLEASE NOTE: Any design you submit must be one that you created, or you must have the legal right to use it. You may not use material owned by others unless you have their permission. Also, your design must not be offensive, obscene, defamatory or discriminatory. we reserve the right to reject any order. If someone makes a claim against SellMyTees because of your design, you agree to pay for any loss we suffer as a result, including our legal expenses. By registering as an artist at SMT, and uploading original artwork, you are making it available for purchase to be used by SellMyTees stores. By purchasing a design, store administrators can use your design for printing purposes only- on a tee shirt, sweatshirt, or hoodie. Once you have been approved, simply login, and then click the Designers Admin Button in the top right corner. To add images, click “View Artworks.” Then click the “Add” Button. This will bring you to the information screen. This is where you add info about the artwork you are going to upload. The “Sku” field is so that you can assign a number to organize your images. You can use a number, or the name of the image itself. Next is the product name, then a short description. Enter the price of the artwork (amount you wish to charge) and enter keywords in the Search Tag field. Click “Save.” After your info is saved, click “Images”. This is where you will upload your artwork. SellMyTees accepts .jpg or .png file formats only. For best quality and optimization, upload the image file at the intended print size at 200DPI. The “Insert Image” box will appear- from here you can browse images on your computer to upload. Once the image is finished uploading, it will appear in the box. SellMyTees uses a state-of-the-art digital printing process that prints directly on the garment in CMYK. To do this, the artwork, which you are viewing on a bright monitor, must be converted from RBG to CMYK. In this color conversion, some colors values may have to be changed so they can be printed using CMYK inks. Designer Studio will print whatever is within its printing parameter box. If you are putting a logo on a dark garment, the logo should be uploaded as a transparent PNG with resolution of 200DPI. If the logo is on white background, it will be printed. See example. Designer studio accepts PNG and JPG image file formats. PNG format is preferred due to its ability to save with a transparent background, and its loss-less compression, best for gradients and text. Resolution of both formats should be 200DPI for best print results. Dimension should be the size to be printed. Resolution must be 200DPI for best results. Resolution refers to the horizontal and vertical pixels that make up an image. DPI (dots per inch) also PPI (pixels per inch) refers to how many of those pixels are in a square inch. Although they are completly different DPI is the most commonly used terminology. 200DPI image is going to give you higher quality and detail than a 72ppi image (commonly used size on the internet) because those pixels have to be smaller to be crammed into 1 inch. See example. 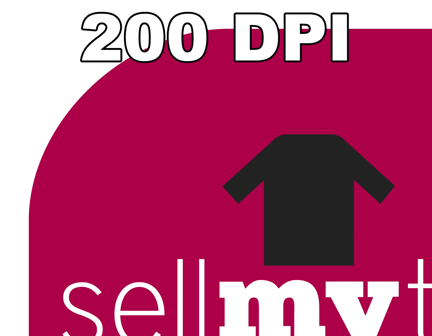 To keep things simple, on SellMyTees we will refer to resolution using DPI. 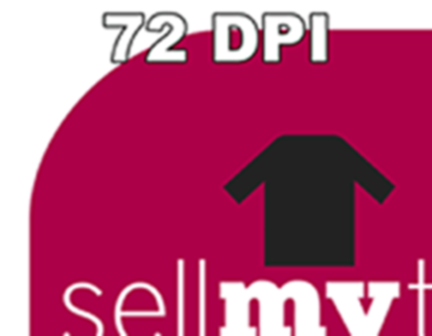 A 72 DPI image cannot be converted to 200 DPI. Most images found on the Internet are at 72 DPI, which is the recommended resolution for on-screen viewing but not printing. When you upscale an image from 72 DPI to 200 DPI, you are lowering the quality of the image even more. The dimension size of the PNG or JPG file should be the size you want it printed. Files can be made smaller once uploaded but it is not recommended to ever make it larger once uploaded into Designer Studio. Making it larger will make the design blurry. The larger it is made once uploaded the blurrier it will become. Note: If the design looks blurry...it will print blurry. See Designing for Dark Garments for further details. Also all formats must be uploaded in RGB color mode. You can save four designs for later use. When in Designer Studio click on "Save Design" button. This will save your design in "Saved Designs" section which can be found in "My Account" page. To retrieve "Saved Designs" go to the "My Account" page and click the add(+) button. It will automatically load into Designer Studio for you to add to a shirt. If you click "Add to Store" button Designer Studio will not allow designs to load after the max has been reached. Three simple steps to add personalization to the back of shirts created in Designer Studio. Steps begin after the sizes of shirts have already been entered. Note: Personalization feature is inactive if a design is on the back. When design is on the back select 'Add Text' button to add name. If not all shirts are getting Names and/or Numbers click the 'x' to the right of the size(s) not getting personalized. Those shirts will still be added to your cart, they just will not have personalization. Follow these 8 step-by-step procedures to upload your design onto a shirt in Designer Studio. For best results file format should be .PNG with a resolution of 200DPI. Load design at the dimensions you want it printed on your shirt (Note: Can be larger but never smaller). JPG format files will work if the design backdround is not transparent.